This is my favorite vanilla cake recipe since it makes full use of whole eggs vs just the whites. I often find because I love making Swiss meringue buttercream that I don't need any other recipes with extra yolks. This is a great vanilla cake that is light but with a denser crumb. It pairs wonderfully with fresh fruit and whipped cream. I love to use it in my layer cakes cause it's also super stable and provides great height after baked. 2. Grease and line 2 x 8 inch round pans with parchment paper and then set them aside. 3. In a stand mixer bowl, add eggs, sugar and vanilla then set over a double boiler with simmering water. 4. Stir lightly but consistenty with a hand whisk over the pot of simmering water, heat the egg mixture until the sugar has dissolved slightly and the mixture is approx 115F. This whole process takes about 3-5 minutes long. 5. Place the bowl on the stand mixer with the whisk attachment and beat mixture on high until it triples in volume and reaches a ribbon stage. Will take about 5-7 minutes. Remove whisk from mixer and pull batter up and see if it can be “ribboned” back into the bowl. If it drips and looks too soupy, keep whisking. Make sure to watch the bowl and check many times since you do not want to overbeat your eggs. Eggs will never be fully firm but you want to get as much volume as possible. 6. In a separate bowl, add flour and baking soda and whisk to combine together. Sift mixture into the whipped eggs and hand fold with a rubber spatula until just incorporated. Do not over fold or you will deflate your nicely whipped eggs. 7. 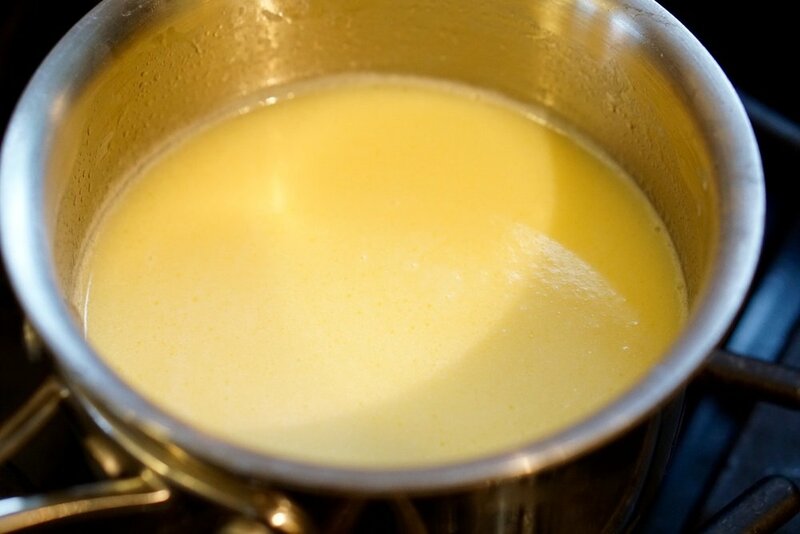 In a small saucepan, heat the milk and butter until it’s slightly hot but not scalding. 8. In a separate bowl, remove about 1/3 of the whipped eggs and incorporate all the milk and butter. Whisk together to incorporate. Then take this mixture and add it into the remaining whipped eggs in 3 incorporations. Mix gently. 9. Pour batter into prepared pans till they’re about ¾ full; keep in mind that this cake batter doesn’t raise a ton in the oven. Do not bang these cakes against a rack like you would other cake batters. We want to keep it light and airy. 10. Bake in the center of the heated oven for 35-40 minutes and rotate the cakes when they are 2/3 of the time done baking, keep in the oven until a toothpick comes out clean. 11. Cool cakes in the pan on a wire rack for 5 minutes then turn out of the pan and remove parchment paper. Allow to cool completely on a wire rack.